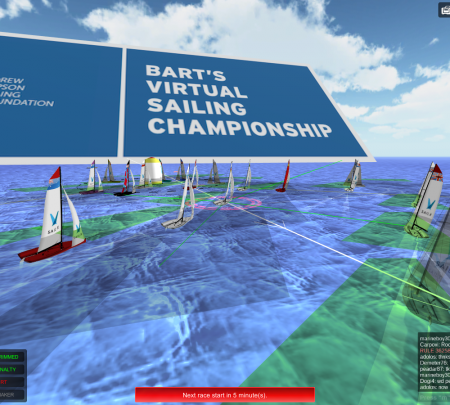 Bart’s Virtual Sailing Championship is back. Sail away those winter blues with Act 3 of the virtual fleet-racing game with SailX. The game which has been created to help sailors, clubs and coaches stay active over winter, and help raise funds for a great cause. So far 2 of 6 Acts have been completed, with Act 3 due to take place on Tue 15th, Wed 16th and Thu 17th December. There will be Six official BVSC fleet race regattas, which will take place on each of these days, starting at 0400 GMT, 1000, 1200, 1800, 2000 and 2359 GMT. Each regatta comprises of 5 races back to back. Entry is free and open for the duration of the Championship. Players are asked to make a voluntary donation to the Andrew Simpson Sailing Foundation if you’re inspired by what we are doing.